The Twice As Nice Liner is truly revolutionary! The Twice as Nice liner separates our uniforms from the typical scrub. 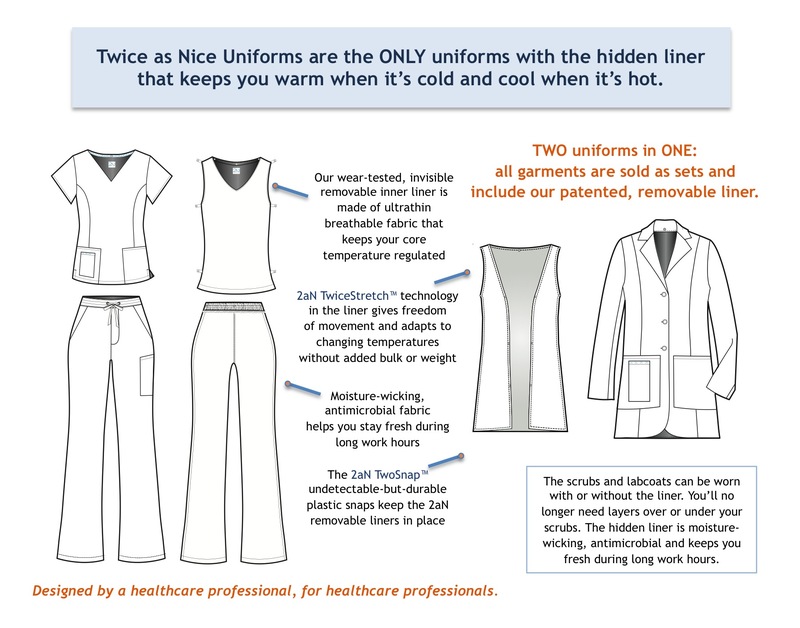 Each uniform comes as a set – an outer uniform along with a hidden, removable liner made of antimicrobial performance fabric. Not only does the liner make our scrubs incredibly comfortable, it eliminates the need to purchase and wear layers either over or under your scrubs – saving you money and hassle – all without adding bulk or weight or limiting movement. The liner breathes and wicks moisture, keeping you dry and fresh and warm when it's cold and cool when it's hot. Attached to the outer scrub or labcoat with nearly undetectable snaps, the liner can be quickly and easily removed. The inner layer is not noticeable through the outer garment. You can wear the scrub top, pant or labcoat with or without the liner or any combination, giving you flexibility and options. The scrub top liner is a shell that keeps your core warm without adding bulk or weight or limiting movement. It truly eliminates the need for long sleeves (and the worry of liquid splatter on your sleeves). In heat, it breathes and wicks moisture, keeping you dry and fresh. And, if you want coverage on your arms, try our Comfort Sleeves. The scrub pant liner is carefully designed to not add bulk at the waistline. It sits comfortably below the waist and snaps just above your ankle so it stays in place. The labcoat liner is a sleeveless shell that, like the top liner, keeps your core warm without adding bulk or weight or limiting movement. The Twice as Nice labcoat can be worn over scrubs or street clothes for added warmth.